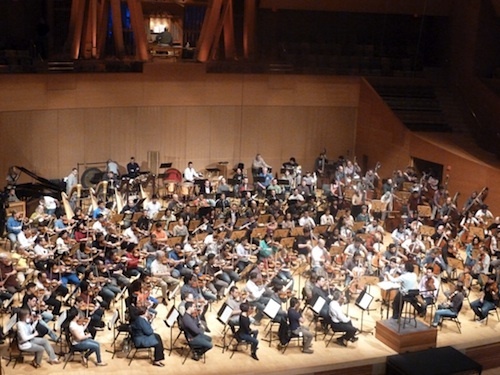 V.com weekend vote: In how many orchestras have you played? About a year after I started playing, I'd already joined a youth orchestra, then I joined several more. In college I played in the symphony, but also in many gig orchestras, many regional orchestras. Today's question is something I can't even answer; in my 30 some years of playing the violin I've certainly played in more than 20 orchestras in the many places I've lived -- Denver, Chicago, Omaha, Cincinnati, LA. Especially if you count things like pick-up gigs! Still, it's fun to try to think of them all! It's also fun to meet people many years after the fact, and realize that you've played together before! How many orchestras have you played in? P.S. Many thanks to Mark Roberts for the Weekend Vote idea! If you have an idea for the weekend vote, please click here and e-mail me! February 13, 2015 at 07:43 PM · There's no option for "none". February 13, 2015 at 09:15 PM · That's a good point! I've re-started the vote, adding "0" as an option. Please vote again if you already voted in the other one! February 14, 2015 at 08:51 AM · Glad there's an option for 6-10. Difficult to know at what point the group you happened to play in qualified as a fully-fledged orchestra. Maybe the benchmark could be number of times per rehearsal-hour you need to rub out old bowings and pencil in new ones. After membership of the NYO and the usual student symphony orchestra (in my case CUMS) I did 2 spells of service with each of 3 professional orchestras. One of these changed its name between the first time I joined and the second. Do I count this one twice, i.e 4 professional bands ? Then there were regular periods of freelancing with 3 others, and odd isolated gigs with 2 more. I did change LOTS of bowings. February 15, 2015 at 12:39 AM · I voted 6-10, which includes orchestras I've played in regularly over the years, but don't any more. I haven't included numerous one-off orchestral gigs or gigs with various folk bands or dance bands. For the last few years I've been playing regularly in 5 orchestras, one of which is a non-performing chamber ensemble ideal for sight-reading and experimenting (and the one in which I am occasionally asked to play cello if there is a dearth of same). February 15, 2015 at 10:52 PM · I checked 1-5, which I see has the most votes at this hour. The CSO's training school was the last ensemble I played in -- one summer session and a couple of regular seasons -- starting in my later teens. It was an experience I wouldn't have wanted to miss. Yet it made me realize, at length, that I wouldn't like the music business after all -- especially the long evening hours and high decibel levels in symphonic playing. So, at 21, I decided not to go on. If I'd felt otherwise -- who knows? -- I might have played in 20+ ensembles by now. February 17, 2015 at 05:02 PM · What orchestra is pictured? Did I count 8 stands of first violins? That's a lot!